When it comes to old trucks I'm a sucker for Ford F-100's. However, I must confess I am a bit biased because my dad had one when he was young. The stories about it from him and his mates have stuck with me. Dad's F-100 was a red 1956 with a 308ci V8 and a piece of channel steel for the front bumper. The motor was blue printed and rebuilt by an old guy who built racing engines. Dad mostly did this so he could win the annual 'race' at the 90 mile fishing contest where 2000 cars would line up and race off in opposite directions. Imagine that, 2000 cars, on a beach! I am hoping to get some pics of dads truck and old fishing contest photo's. There is meant to be one of dad going round the rocks at the end of the beach with wheels in the air and the running board digging into the sand causing a huge rooster tail. Fantastic. 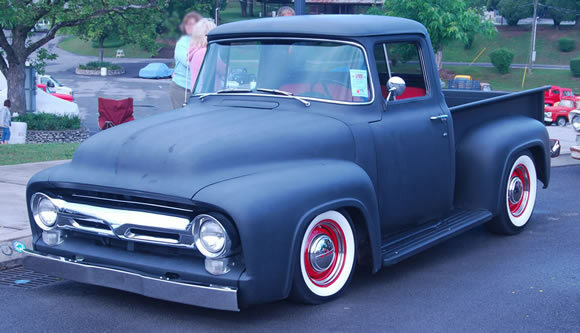 The F-100 above is my idea of a beautiful truck. Love the matt paint, red rims and white walls. Very cool and very smooth. P.S. See more beautiful motoring daily on our Facebook page.